North River NY is our home away from home in the mountains. As the little sister of a more well-known ski town to the south, North Creek, it can be overlooked, but the ski culture runs deep. The two towns are joined at the hip, and in many ways North River relies on North Creek for it’s very existence. But North River has a personality of it’s own. Like North Creek, North River’s ski roots are nordic. Both towns have been kicking and gliding for decades. But while North Creek maintains big beautiful lift-served mountains, mechanical lifts have been silent in North River since the closure of Harvey Mountain in the 1970s. Still a recent trip three-day trip to town wasn’t nearly enough to sample the options for skiing within a few miles of our camp. When I arrived midday on Friday, I was torn. Should I head into the woods behind our cabin where the snow was clearly beautiful? 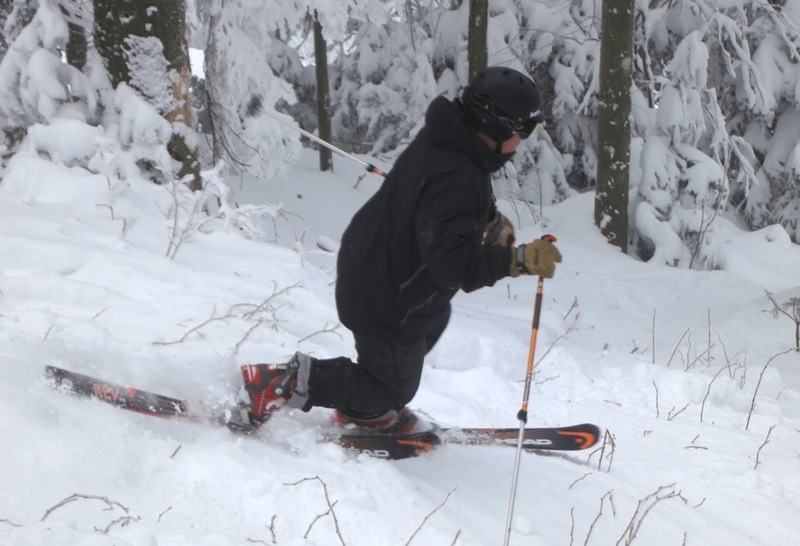 Or go over to North Creek for the first tree skiing of the year at Gore? I chose the big mountain as a friend was expecting me. The last snow had fallen wet, and it was now cold, but somehow conditions were great, not icy at all. On the lifts we could hear only muffled sounds rising from skiers without any early season scrape. From Uncas, I noticed that Gore was blowing Hawkeye and I knew they were planning to open the summit the next day. 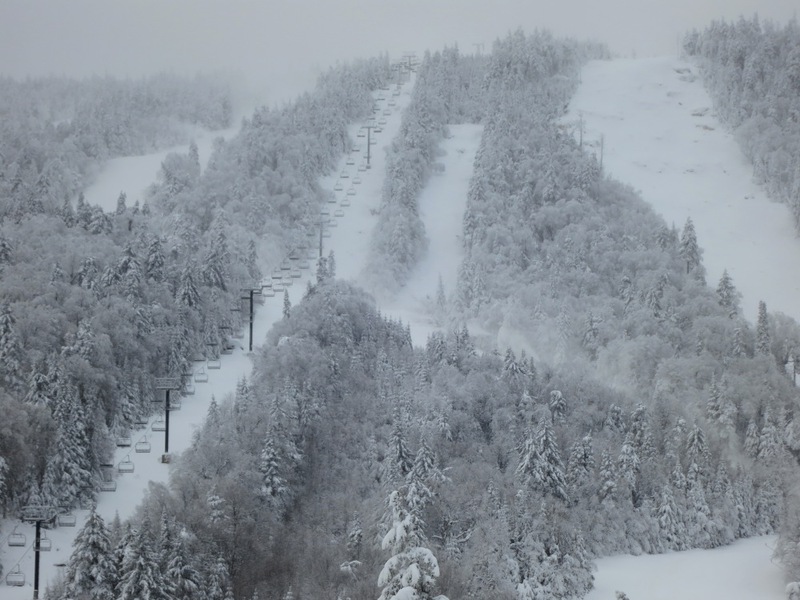 With two new lifts coming online just after a storm, there’d be great skiing at the top. The conditions I saw were good or better, and I went until close. The Gondola was silent as I finally skied into the base area at 4:15 pm. Without doing any chores in town, North Creek that is, I headed back to the cabin to put on some wide waxless backcountry skis. 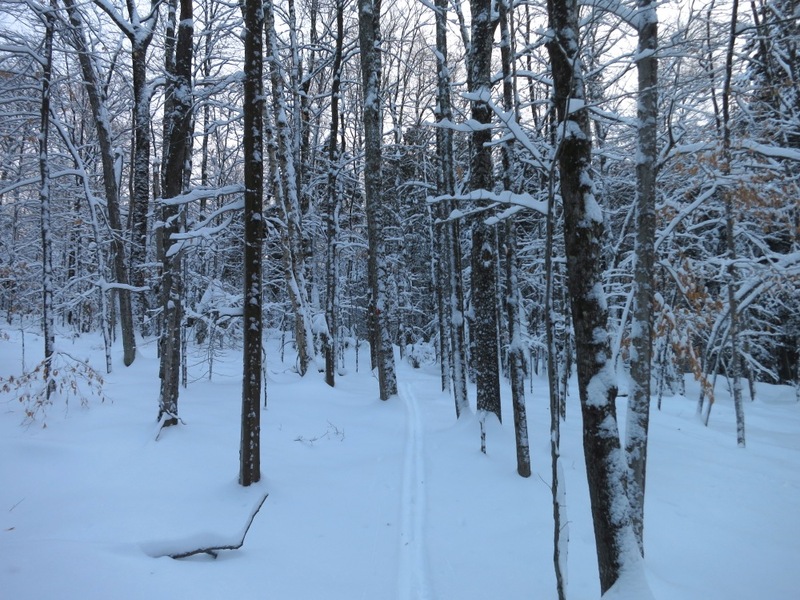 We put some ski trails on our land this past summer, and in a lighter, earlier snowfall I ventured out on skinny skis, skiing our trunk trail, the yellow trail for the first time. This snow was heavier and deeper and I was sure I could complete the bigger loop, tracking up the red trail for the first time. As I headed out I got a text invitation to a gathering of North River skiers at a neighbors house. After an hour in the woods with my headlamp, I skied down the road and knocked on the door. It was a friendly gathering, and I soon learned of a plan next to meet at the North Creek Ski Bowl in the morning to organize a shuttle and ski Raymond Brook. I pushed for a later start that would give me time to ski some of the untracked glades off the Straightbrook and High Peaks Chairs at Gore before heading to the Ski Bowl. 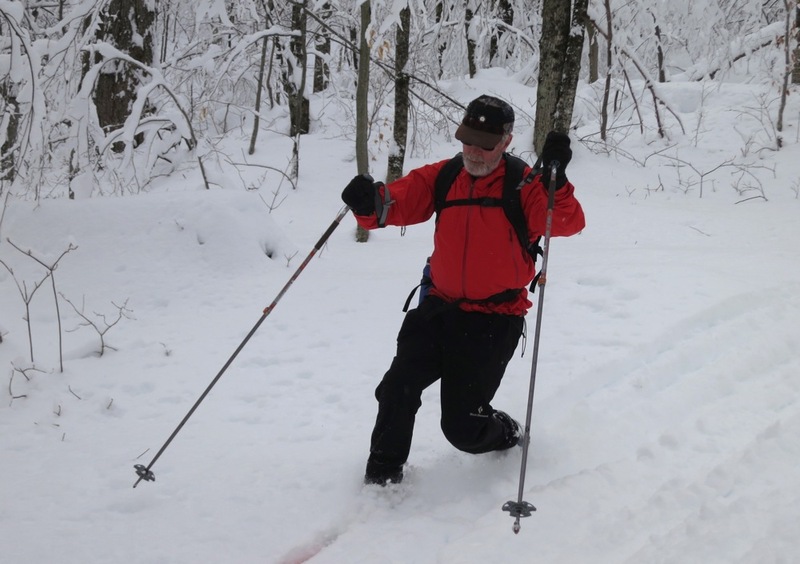 But some in the group had skied the trail a day earlier, and wanted to get an early start. 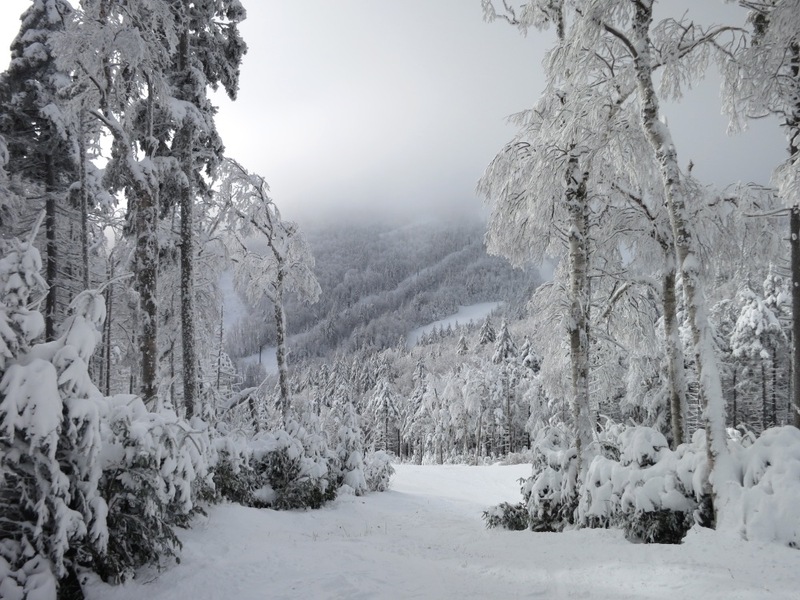 It’s a great ski trail with lots of opportunities to turn as you descend over 1000 feet. The snow was incredibly deep at the top of the route, and was thinner but plenty serviceable at the bottom. We finished our ski in the early afternoon, and I considered going back to Gore to ski the top. But I was pulled back to our own new trails, continuing to groom by skiing, until well after dark. Sunday’s a travel day for me and skiing Gore makes sense. We packed it up, drained the pipes and headed to the Big Mountain. The summit was in play, and the snow was so good that the locals were skiing on a weekend. As is often the case, The Darkside was especially nice. 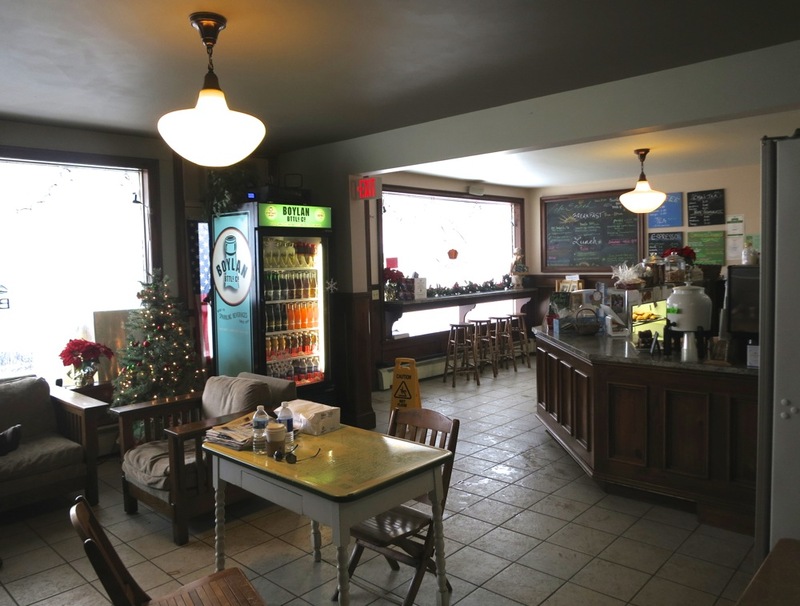 Before clearing out, I grabbed coffee, sandwiches and a chocolate chip cookie for the road at Sarah’s in North Creek. With lunch in hand I headed down the road. I ride some slow fixed grips and do a lot of driving in winter, so I have a lot of time to think. On the way home it occurred to me that North River really is a great little ski town. 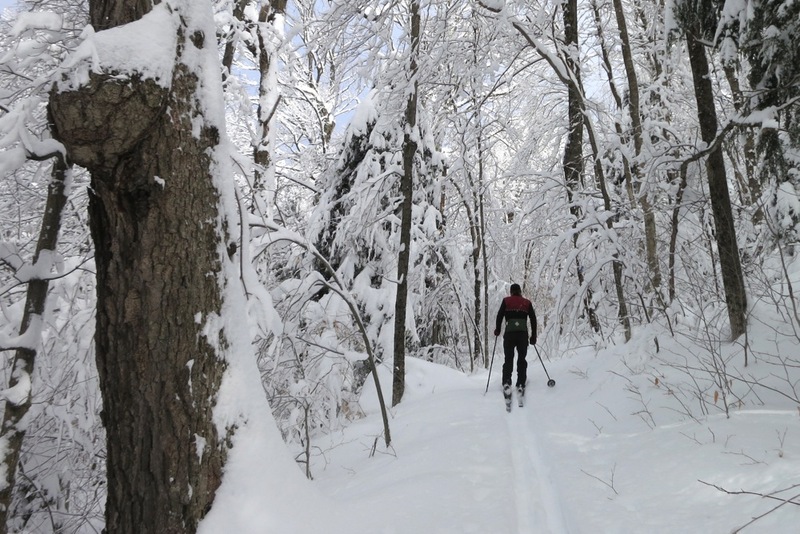 Multiple options for skiing include Gore, The North Creek Ski Bowl, Vanderwhacker sidecountry, Garnet Hill Lodge, The Siamese Ponds Wilderness and our own trails out the backdoor. But there’s more to it than that. North River has a history of skiing that’s close to 100 years old. And it seems that on almost every street in town, there are skiers. Locals and visitors alike have a strong love skiing that bring us together. I must say, you truly have a very nice blog. It also appears you have a very nice life. Glad it is muy bueno for you and yours. Thanks for all you do, Harv. Thanks for providing this space for us. You can ski out your back door? Living the dream my good man. As soon as Mt. Beacon fills in (March if I’m lucky at the rate of this week’s weather), I’ll be doing the same. Envious, spent that weekend trying not to get more sick, I should of just went for it. Harvey – Excellent! We don’t need no stinkin’ lifts! That said it would be nice to combine lift rides with “high mountain touring” through Highwinds, Raymond Brook and Rabbit Pond – endless possibilities. 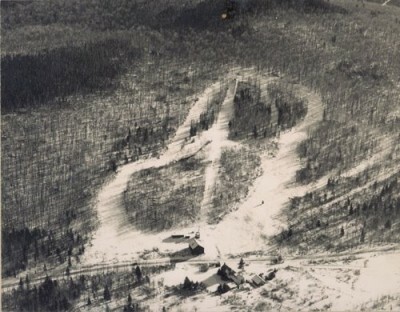 I live in North River and your Blog was sent to me by R. Michael Butler whose parents operated Harvey Mountain. 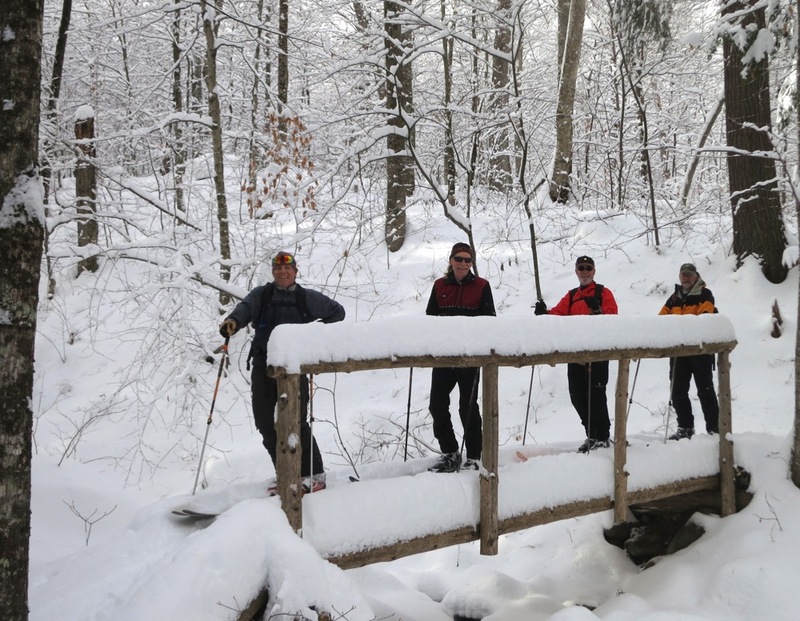 On Sat, Jan 10 at 5:00 we are having a presentation on the old ski trails in North River and North Creek. The presenter, Jeremy Davis wrote the Lost Ski Trails series. We will also have a panel of several old timers who skied these trails in the late 30’s (as little guys) through the 60’s as well as the audience participation telling of other old ski stories. Wine and snacks to follow. We would love to have you and any of your followers to join us at Tannery Pond for the event. I’m not familiar enough to grasp the nuances between North River and North Creek, but the whole area is amazing to me. Glad to see such quality skiing so early, maybe we’ll get a Xmas miracle and survive with a base waiting for fresh snow before the new year. Susan, sounds like a worthwhile event! North River/North Creek provides a wealth of excellent skiing opportunities. I am glad I was lucky to enjoy the weekend. 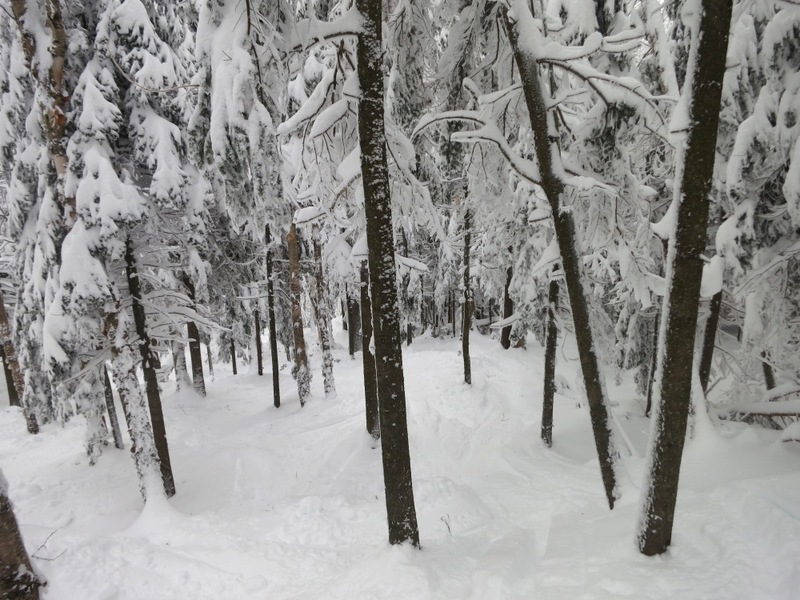 This blog continues to be a happy reminder of the wonderful skiing in NYS. Great blog post. I love the history and the skiing in the gore region. There are so many options for trips in that area. We just need to get back to winter. Steve Ovitt and his volunteers have a done great job re-establishing the trail network. I have a place in North Creek and have been viewing your blog for a while. A question: “Susan Forest” made reference above to a get together at Tannery Pond on the 10th. Is this event open to anyone who’s interested? I’ve been skiing the area (Garnet Hill, Botheration Pond Loop, etc.) for years, but haven’t really become familiar with the local skiers. Chatiemac X-C Skier… this event is definitely open to the public and it would be great if you can attend. Thanks for following NYSkiBlog. Do you have any info on the Martin Trail that runs from Harvey to Thirteenth lake road? Cloudsplitter… I don’t! But I’d like some. Please ask Martin and report back!